Start Location: McMenamins Grand Lodge Please park and gather in the far east parking lot away from the building. Entry Fee: $10 ($15 for Non-RUSA members) Checks should be payable to "Oregon Randonneurs", also, Oregon Randonneurs membership is required for this event. You can download a membership form and bring it with you. Register Now! Driving Directions: See McMenamins' website. Support Vehicles: Any rider(s) planning to have a support vehicle meet them at controls must contact the ride organizer. 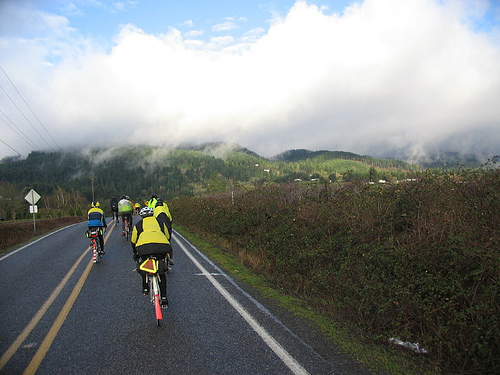 This brevet starts at a new favorite location in Forest Grove and is quickly heading into the Coast Range. We head west along Gales Creek, avoiding the traffic of Hwy 6. We are on the highway a few miles before heading up Timber Rd. Timber has a PO, that is about it. We continue north through forest land, cross Hwy 26, and along the Nehalem River towards Vernonia. Vernonia has plenty of services, but we have a staffed control with hot drinks and home-baked goodies at Anderson Park. The park has a covered picnic area, warm bathrooms and showers if you are truely desperate. After Vernonia, you continue north out of Vernonia towards Kersey along the road that eventually turns to gravel. A huge heard of Elk were spotted here in 2006. After a bit of outnback to an informational control (no gravel), you head towards Birkenfeld on Stoney Point Rd., catching Hwy 47 before Mist. You ride along the Nehalem River to Birkenfeld Store, the turnaround. You will find some drinks, groceries and a grill here at the 1910 store. This is logging country. Turn around and head back to Vernonia for the second time. 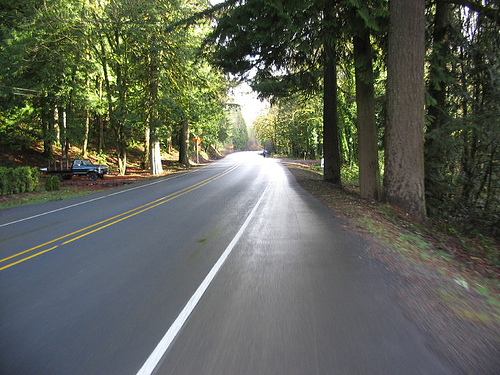 After leaving Vernonia return to Timber, Glenwood and finally back to Forest Grove. What to do after the ride? You'll be ready for refueling and refreshments at the Grand Lodge. If you eat here, you can also partake of the free soaking pool. Bring a suit and towel then exchange your driver's license for a key to the pool at the front desk. Cumulative elevation gain is estimated at 5000 feet. Need more info about Forest Grove services? Check the Forest Grove Chamber of Commerce website.